Whether it is a weekend away or a long-haul trip, travelling away from home can be stressful if you need an accessible bathroom and you know that the place you are staying may not be fully adapted. 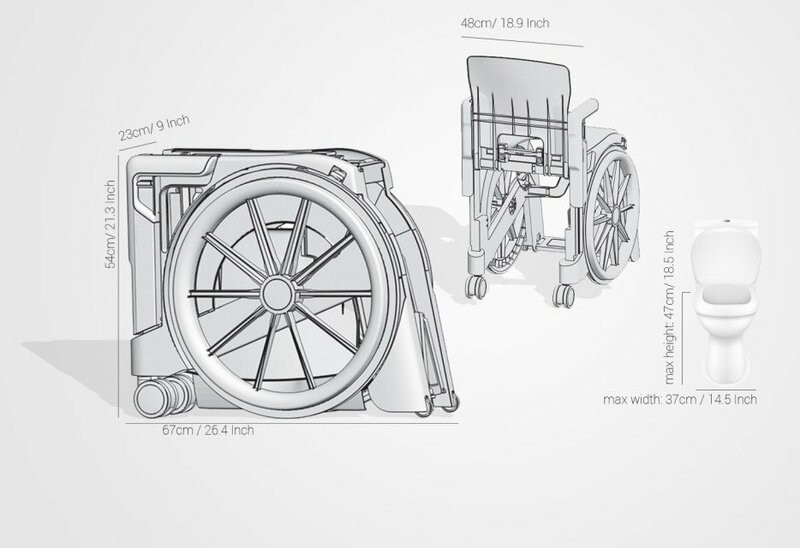 However with WheelAble, the unique, folding shower chair that doubles as a commode, it is now possible to take your shower chair with you which gives peace of mind, knowing that your stay away will be hassle free. WheelAble is lightweight, water resistant, compact and easy to manoeuvre in confined spaces, providing greater independence. It is easy to wash down and keep clean and folds up neatly into a transport bag with wheels, ready to store in the boot of your car or train or plane. Winner of the Product of the year award, WheelAble is fully portable and made from strong moulded plastic. Designed with cutting edge technology, WheelAble's design and development maintain a perfect balance between appearance and utility. It has height adjustable handles and foot rests and the large push wheels means that it is suitable for self-propulsion. Wheel locks are also included for added safety. When it is needed for toileting, the seat of the chair fits easily over a standard toilet seat with a 470 mm clearance. WheelAble can pass through a doorway of 50 cm width and can therefore be used in malls, airports and other people's homes. Please note that the fitted seat is fairly firm and may not be suitable for those with high risk of developing pressure sores if you need to sit on the seat for an extended amount of time. CLOSED SEAT. A fully-upholstered seat (without hole) that can easily be attached to the hard steady seat, in order to transfer to chair into a slim wheelchair for narrow passages (transfer chair). "As promised a quick report on how I got on with the seatara shower chair. Well, thank goodness I took it with me as the disabled bathroom was totally inadequate which unfortunately I come across all to regularly. Having the Seatara chair meant that I could use it as a commode and a shower chair which gave me the confidence that I was using something cleaned to my standards and safe. The only problem I encountered was that it was difficult to wheel on the thick plush carpet in the hotel bedroom, but was fine on the hard floor in the bathroom. All in all a great success.